Embody one of Hollywood's hottest trends in jewelry. This designer-inspired multi-crystal ball bracelet symbolizes tranquil energy. 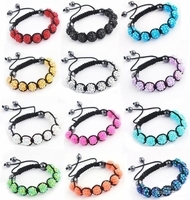 Featured in fashion magazines, these glittery bracelets are big on style, but not on price. Adjustable 8" to 10" length.